Not seen such an item for the 800 before. A complete brand new first aid kit. I had assumed they existed for these cars though. Rimmers used to sell them some time back. The sad bit is that while they're nice to have, you couldn't use it. First, using it would destroy the completeness of it and secondly, the dressings etc would almost certainly be out of date so couldn't be guaranteed sterile. Would be great for show use though! Then keep a cheapie Boots/Superdrug or similar First Aid kit for emergency use. Yes, or I suppose one could just put the contents of the cheap kit into the 800 branded bag. Why make work for yourself? Keep the Rover one nicely bagged in it's wrapping and just use the cheap one if necessary. More of a space saving idea. The spare wheel in my boot is crammed with stuff. The glove box as you know holds very little. IF you only add the Rover kit for shows and similar then that will save space and it won't get scuffed by being crammed in next to something else. Alternatively have a ruthless de-clutter! True . I think I might look for a space saver wheel to make more room and save weight. Forever carting the spare wheel around and I've only needed to use it once in the 5 years I've owned the car. I'll look out for one. I'd stick with the proper 16" alloy spare if i were you Charles! No real weight saving as the space saver is almost as heavy as a full size alloy spare because alloy is lighter than steel. I've got an LPG tank in my Coupé where the spare wheel was and will have the same in my Sterling soon as well. There's already an LPG tank in the Volvo spare wheel well but not yet plumbed in. If i need to take the spare with me for a longer journey i just chuck it in - let's face it the Volvo won't notice the lack of space and neither will either of the Rovers, they both have cavernous boots! Even if either car did need that extra bit of boot space, i'd wrap the spare in a bin bag and put it in the rear footwell. That's a fair point. I've no idea where to source a space saver as they were never designed for either the Honda version or the 800. I've seen a few 800s with them in, the tyres are abominably expensive and are more or less single use. Usually they get thrown in the boot of a scrap car as nobody likes them for many good reasons! The only thing i could suggest is a steel spare as alloys tend to have more metal for strength. I've got a couple of 15" steelies with reasonable 195/65/15 tyres on (same rolling diameter as the 205/55/16) if that's any help? Thanks Dave but I have x5 of the 15 " in storage as on the car I fitted the 17inch wheels. Though last year I buckled two 17inch wheels, one of which was coming back from a Longbridge meeting. So I have one of the 15" wheels as the spare now. Still need to have the 17" wheel repaired but to be honest, it's that badly buckled I think it's beyond reasonable repair and at the end of the day, I'm sure I would find a cheaper used 17" wheel as a spare (when I start looking). Have you thought abut a set of these instead? Relatively easy to find on fleabay and breakers yards - the 17" 6-spoke Rover wheels are near impossible to find these days as almost all are buckled or are jealously hoarded by the owners. Good idea, but considering what I'm spending on essential bits now and I've still the mechanics to pay. I only need one wheel unless I buckle one of the Rover 17" wheels. It would look odd having a 17" wheel on the car that didn't match the rest of the car. Individually they're a lot cheaper and you can often get complete (but scruffy) sets a lot cheaper. I only picked those to show you the design. Good luck finding a Rover 17" wheel, as i say, they're thin on the ground and buckle as soon as look at them, which is sad in a way. Also if i spot a set in the Volvo forum for a sensible price i can keep a look out for you. 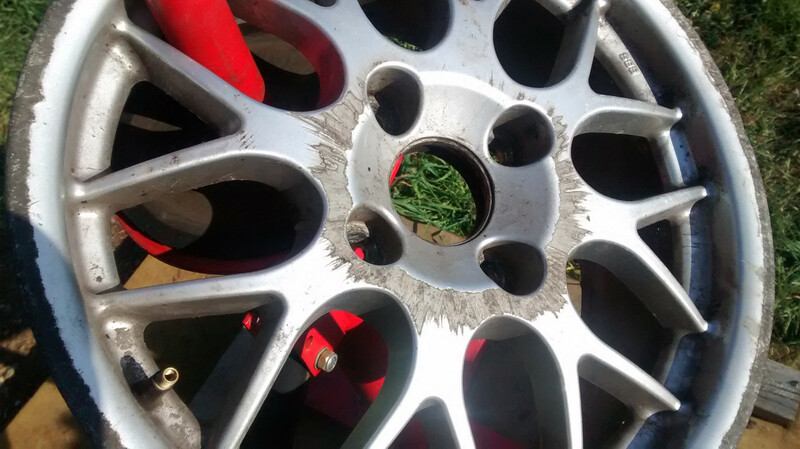 The reason i went down the alternative wheels route is because i had two buckled RS 7-spokes (16"s) and some of the remaining wheels on both cars had suffered damage where the wheel nuts go because of "YL-U-W8" tyre fitting type places. 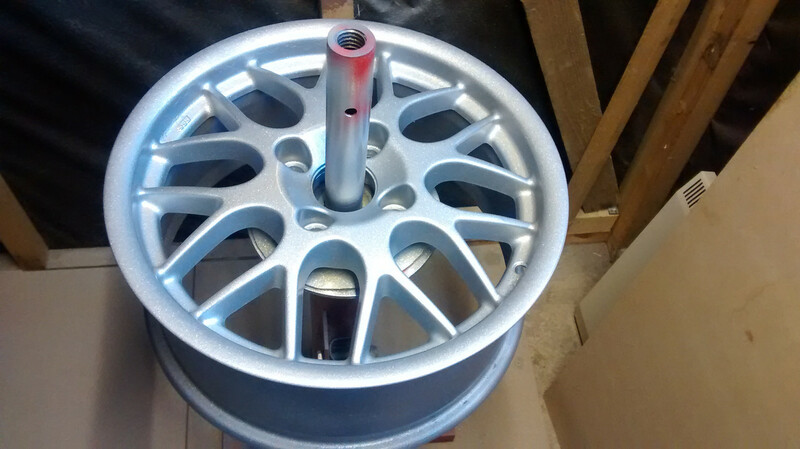 I found ONE RS 7-spoke 16" wheel, secondhand for £150 + P&P. Granted it was good but Rimmers were still listing new stock (although they didn't have any) for £132 each plus the usual horrendous P&P from them. In other words, new ones were cheaper but they didn't have any. That's when i started looking and discovered the 98-02 Volvo S/V40 and similar used the same offset and PCD, as did the Mitsubishi Carisma aka Volvo S40. 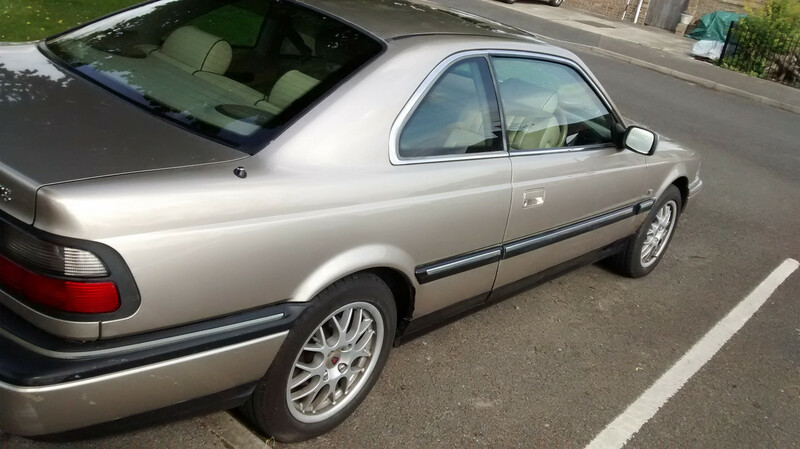 Obviously Honda Accord and Legend models with 4 stud fitting used the same PCD as well, as does the Rover 600 but again, finding secondhand wheels was like finding hens dentists! As you can see, they were pretty rough when they landed but for £40 for the set, i didn't complain too much! After refurbing them they came up pretty good and a couple of coats of lacquer improved what you see in the second photo. They suit the car and are 7J like the Rover 17s but still on 205/55/16s, just without the "balloon" effect caused by the 6J Rover wheels.